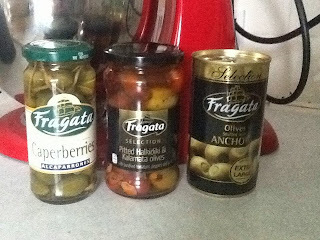 I'm always looking for yummy things to try we got sent a selection of Fragata goodies to test out. More than 86 years on and Fragata Spanish Olives are now sold across the world and remain a firm favourite and kitchen staple for millions of Spanish families. What’s more, they stick to their roots. A family-run business to this day – now in the fourth generation – the company proudly retains its olive traditions established in 1897. The ‘Manzanilla’ and ‘Queen’ olives are still picked ‘ordeño’ (by hand) when they’re perfectly ripe from the very same olive groves Don Santiago harvested, and collected in a padded, esparto basket called a ‘macaco’. This centuries old technique ensures the olives are in perfect condition when they reach Fragata customers worldwide. Fragata Spanish Olives can be used in hundreds of different ways to create authentic Mediterranean dishes and mouthwatering tapas. What better way to create a unique culinary cornet of Spain in your own home – go on, Savour the Flavour of Spain! I decided on a Chicken with Lemons, Caperberries, halkidiki & kalamata olives. First of all I cut the lemon in small slices and roasted them under the grill. I pan fried the chicken breasts in olive oil and black pepper to it started to go brown. I added the chicken stock, halkidiki/kalamata olives and capers. I let simmer for around 8 minutes then added the parsley and cooked for about another 2 minutes then serve.